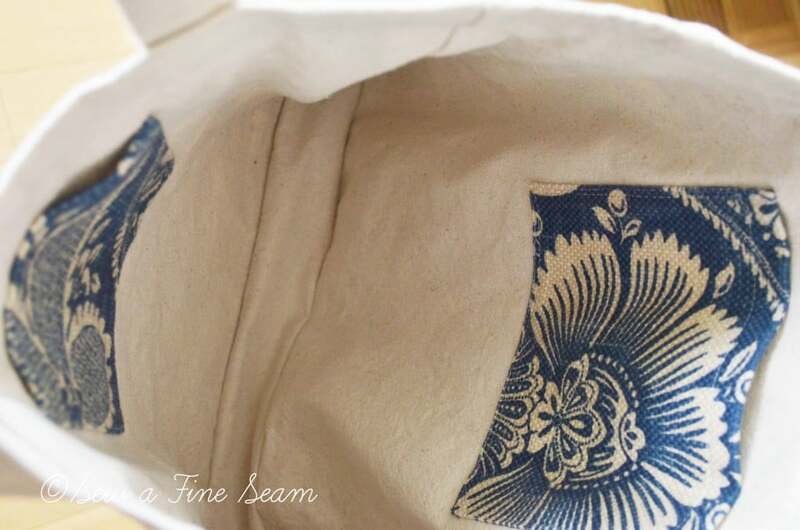 It’s been a bit since I shared any of the ‘fine seams’ I’ve been stitching. 😀 I really do still sew although I have been having a lot of fun with all the great finds I’ve been accumulating. 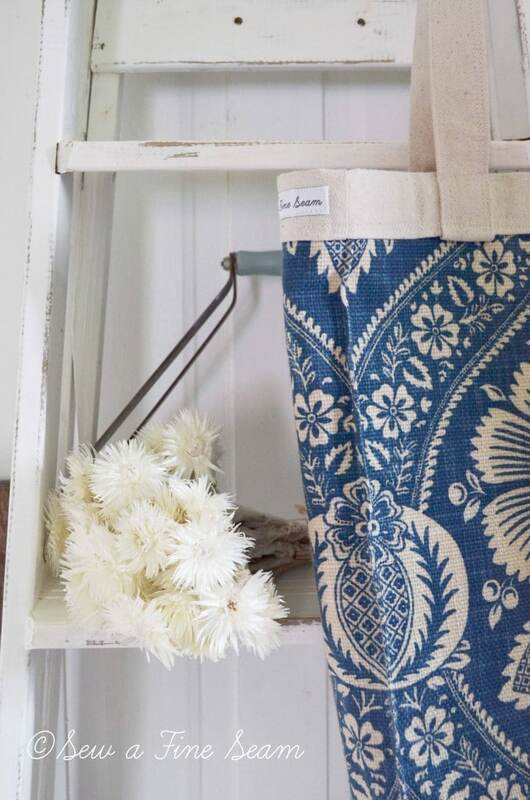 Somehow decor and fun finds are a lot more fun to photograph than the things I’ve sewn lately. I need more inspiration for staging my textile creations! Remember the pleated ruffle pillows I made for Melaine? The ones that made a small sensation because one was monogrammed – by hand? Well, a friend of Melaine saw them and wanted some for herself. If you haven’t met Tricia from Little Cottage on the Pond you need to go over and see her lovely blog and get to know her a bit. She is a doll! 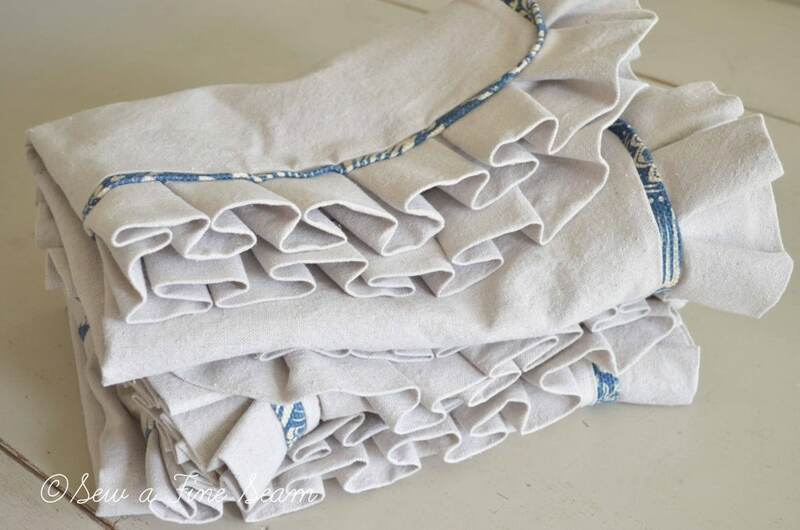 Anyway, Tricia ordered 3 pillow shams with the pleated ruffles. She mailed me the fabric for the flat piping. 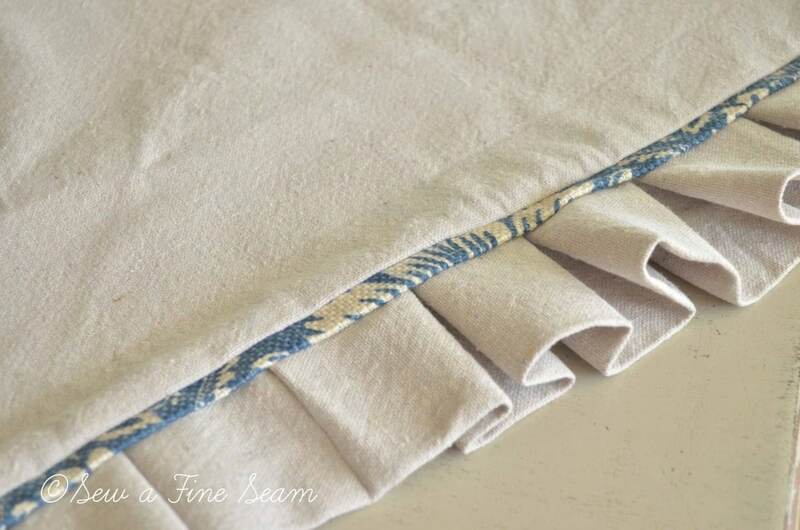 I love this blue and cream fabric. It is from JoAnn’s online store. I was so tempted to order some to have around to create something with but I have SO MUCH fabric that I don’t have room to store so I refrained. There was fabric left over so I asked Melaine if she would like for me to make her something out of the leftovers. She suggested I make something she could give away to her readers. How sweet was that? So I created a handbag – everyone can use a new handbag right? 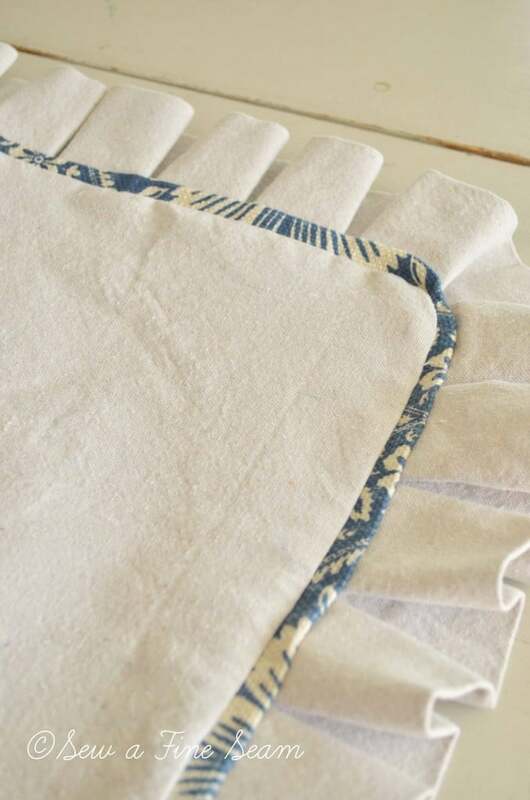 I made the handles out of the drop cloth fabric and then added small pieces of the print to the centers just for fun. This handbag turned out to be quite photogenic. I’m almost to the point of adding blue to my decor. I never thought I’d ever ever EVER say that. But I should have learned by now that you NEVER say never. Most bags need pockets on the inside right? I hope you will go over and visit Tricia! Check out her bedroom where she is using her pillows. Have a wonderful day – it’s almost the weekend again! That fabric is so pretty. 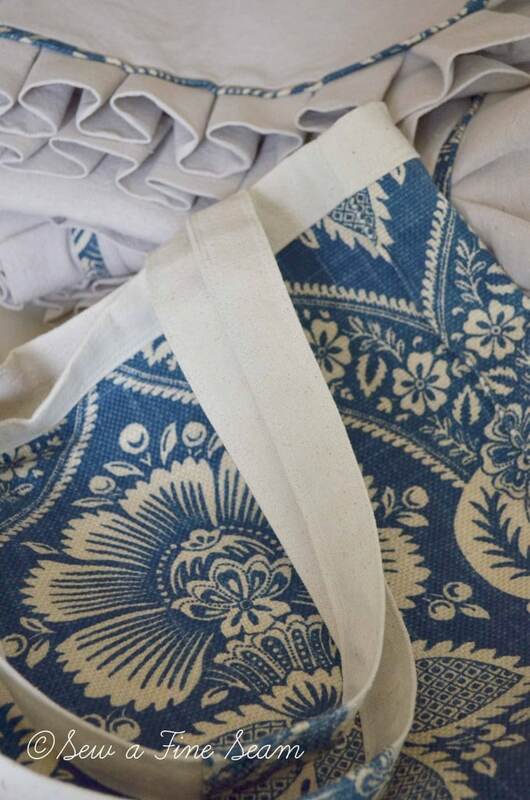 The pillow shams are gorgeous, of course, but that bag!! I LOVE that bag!! 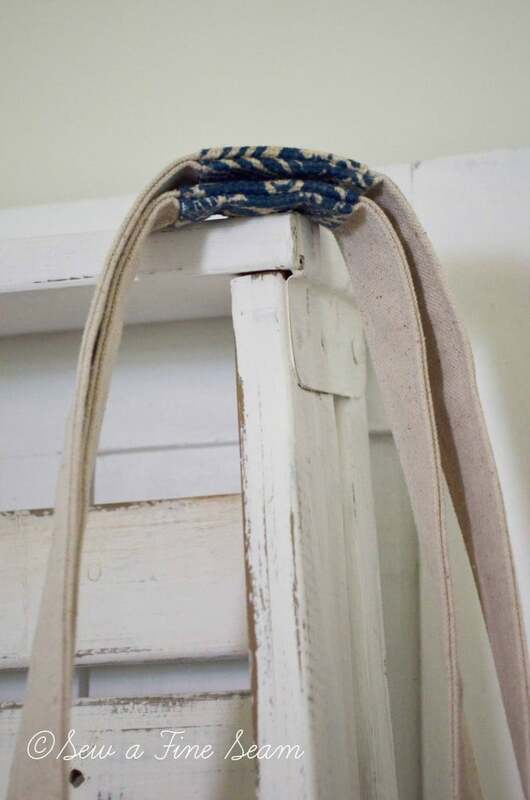 The little pieces of fabric in the middle of the straps were such a great idea, and I love that you used the drop cloth around the top edge. Very designer looking. Not only are you an amazing seamstress, but a great designer as well. I’m heading over to check out her bedroom now. Have a great day! Thanks Debbie – you are so sweet! you are awesome again! how you create- I love it. Thanks Angie 🙂 I’m thinking it’s about time to create some things to whip my house into shape! Thanks Jane! I wish I were on instagram – no smart phone here yet. I know I’m way behind – hopefully at some point this year I’ll be more up to date with technology! Beautiful, Jill! Yes, never say never. I’ve always loved dark, navy blue, so I took that love out on my son’s room. 😉 Is that the same fabric that Miss Mustard Seed used on her bedroom wall? It looks a bit similar. You should totally share this post with her!…cause I’m willing to bet she’d LOVE that bag & pillows. Thanks Jami! Yes, it’s what Marian has on her bedroom wall. 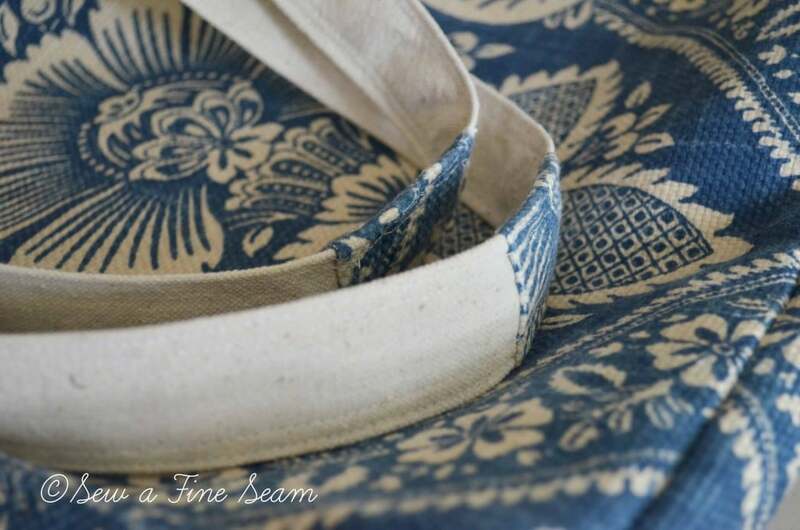 Love this fabric – Tricia used it as her curtains and sent me a piece to use for the flat piping so her pillows would go with the curtains. REally? Planning to add some blue into your decorating?? I’ll believe it when I see it! Is that the same fabric that Marian has in her bedroom? Beautiful work on that bag – as usual! Breida what am I gonna do with you? First you don’t believe I love red. Now you don’t believe I’ll add blue! Sigh. Guess I’ll have to show ya!! LOL! Oh yes, and that is the same fabric Marian has in her bedroom – it’s lovely huh?! So beautiful, Jill! Both the bag and the pillow covers. The detail on the bag handles is a wonderful touch! Thanks Loi! Are you back home again? And it is a very beautiful blue. I think I will like blue after all! Having been familiar with good seamstressing from my aunt I see what a very good professional seamstress you are. You pay close attention to important details and make sure your products are very well done. Bravo Jill. Everything I’ve seen on your blog I’ve paid very close attention to the details. You can be very proud of the wonderful job you do. I was taught to sew by my Mother and mostly my Aunt who was a seamstress for Halle Brothers and another big dept. store in Cleveland, OH. I’m not even close to being as good as either you or my dear Aunt who passed away years ago. I miss her guidance very much. She did instill the love for sewing in me which I’m very glad of. I started sewing as a kid in the 50’s and have kept it up since. I haven’t sewn clothes in a long time but do try to sew all the curtains, table runners, cushion covers and any other decorative items I can handle for our home. Thanks so much Jane! my Mom taught me to sew when i as about 9 or 10. I love creating things with textiles! 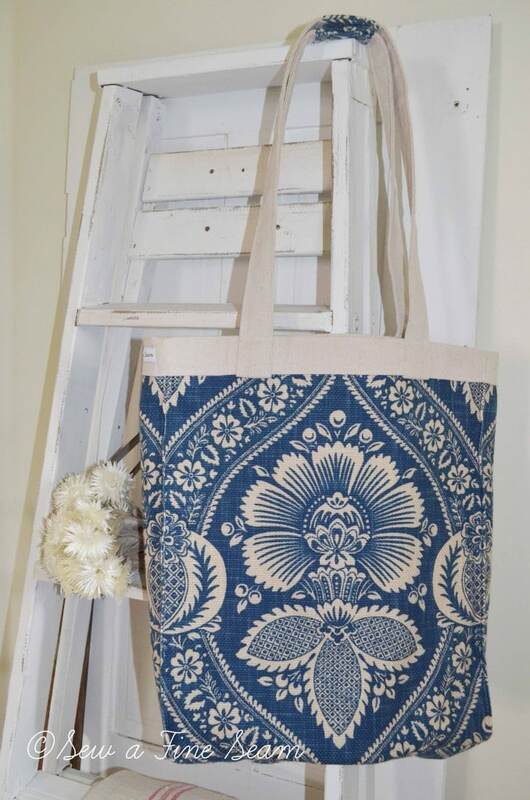 What a gorgeous bag Jill! Love the details! Thanks Leslie, it was fun to make! Thanks Sonya! I think it was this fabric that finally made me decide it might be time to add some blue here and there in my home! I’m still debating trying to use this fabric somewhere. I suppose when I finally decide I want some it will be all out of stock! Thanks Susan, it was a very fun one to make! I hated to part with the bag- though it was so fun to pass the lovely on to one of my readers! You did such an amazing job on our bedroom shams- it just “makes the bed” 😉 You have such a gift!